Financial Fragility and Currency Markets. 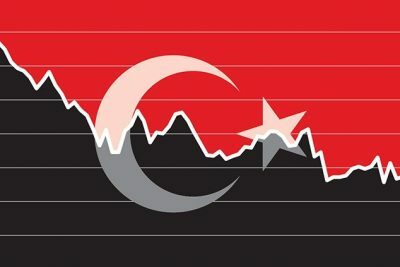 What’s Going on with Turkey? The global economy is again becoming financially fragile. Financial fragility is an indicator of increasing likelihood of the eruption of a major financial instability event–i.e. stock crash, bond market implosion, housing-commercial property price deflation, sovereign debt defaults, etc. The current case of Turkey’s economy is at the center of this process, its currency having plummeted 40% to the dollar just this year. (It has temporarily stabilized this week, but the decline will soon continue once again). But Turkey isn’t the only indicator, other EME currencies are also in sharp decline at various stages: Argentina, Brazil, South Africa, Indonesia, and India. Russia’s Ruble is deflating and China’s Yuan, the strongest, nonetheless pushes against its lower band within which it too has deflated by 6-10%, prevented from falling further only due to China’s central bank massive intervention in money markets to prop up the value of its currency to prevent further devaluation. Rising global financial fragility is rising due to obvious increasing contagion effects. The Turkish LIRA crisis is spilling over to other EME currencies, causing a further decline in those currencies in addition to the already significant forces driving down those currencies. Turkish dollarized debt payment obligations to Italian, EU and US banks are being noted in the business press. Italian bank debt is especially exposed, when Italian banks already sit on $500 billion in non-performing bank loans. The transmission mechanism to a broader European bank crisis might easily occur from Turkey to Italian banks to the general banking system. US banks like Citibank are also exposed to Turkish debt. Other indicators of growing potential contagion from the Turkish fallout are the global currency speculators (hedge funds, vulture investors, etc.) now plowing into short selling of the LIRA, further depressing its price, the rising interest rates on Turkey government and private bonds. The response of other EME central banks in raising their interest rates to try to stem the outflow of capital as their currencies follow the LIRA down. (Argentina being the worst case, as its central bank raises rates to 45%–thus ensuring that country’s current recession will collapse into an even more serious contraction, perhaps even depression). The first phase of the general contagion effects of the LIRA collapse have now occurred. A second ‘shoe’ will inevitably fall within weeks. Financial fragility is rising in the global economy–and will eventually impact the US economy in 2019, thus further ensuring a US recession sometime in 2019 that this writer has been predicting.